When career fair time comes around, your daily task list multiplies. Planning a successful college career fair takes a lot of time and energy. At Career Fair Plus, we make it our business to make the process easier. Let’s take a look at some of the reasons CareerFairPlus is the mobile app that all career service teams need. A mobile app like Career Fair Plus makes it convenient for your career services team to share knowledge and ideas wherever they may be. As more people become involved in planning the career fair, you can widen the communication to recruiters, volunteers, student organizations, and students. It takes a lot of work to put together a college career fair. Much of that work falls under the category of marketing. We’ve learned many things from more than 1,500 career fairs, so we have a solid knowledge base of what works and what doesn’t. Imagine a student who is considering attending the fair but isn't 100% sure they will go. This student downloads the app "just to be safe" and then has that app sitting on their phone as a constant reminder. We look at this as an added marketing bonus. Our customers love the dashboard on MyCFP (the content management system for the app). From the home panel, your team can see the primary information and data about your college career fair. Working from this central location, you can access your marketing materials, data about previous fairs, and dig down into the data from your current fair. You can chat with our support team from Career Fair Plus by clicking on an icon. Or you can watch one of the instructional videos in our rapidly growing video library. Our team is by your side to answer your questions about importing employer data, managing marketing data, and how to analyze the data. The National Association of College and Employers (NACE) found that career service operating budgets are stagnant or dropping. Career Fair Plus offers multiple solutions with our flexible plans. Our Premium Package is perfect for most schools because it contains everything you need to get started including additional customization options, personal consultations, and multi-day fairs. However, for schools with tighter budgets we offer an Essentials Package. We know you have a tight budget, and Career Fair Plus will provide you the framework you need to maximize your limited resources. For even more ways our mobile app can help, see our article: Career Fair Plus: The Only Career Fair App You Will Need. 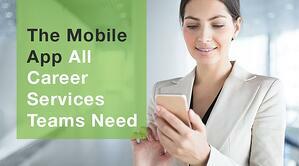 It really is the only mobile app all career service teams need.